The major drawback of PMMA is its inadequate mechanical and physical properties such as low flexural strength (FS), low impact strength (IS), and low surface hardness that leads to reduced clinical performance of the denture.,,,, This ultimately leads to reduced clinical life of the prostheses, and hence increases the patient's dental visits and the cost factor. Dentures are known to undergo various failures such as fractures, de-bonding of the teeth, and other types of failures in complete or partial dentures. According to a survey conducted by Darbar et al. on the causes of repairs involving complete and partial dentures, it was reported that 29% of all repairs to dentures were associated with midline fractures of complete dentures. Therefore, there is a clear need to understand why such fractures occur and to find ways to reinforce the dentures to prevent such failures. A study by Johnston et al. showed that 68% of acrylic resin denture break within a few years after fabrication. This is caused primarily by impact failure when the denture is accidentally dropped on a hard surface or by fatigue failure when the denture base deforms repeatedly under occlusal force. In maxillary dentures, most fractures are caused by a combination of fatigue and impact, whereas in mandibular dentures, 80% of fractures are caused by impact. In most situations, fractures occur in the midline of the denture base., Fracture in this location occurs more often in maxillary dentures than in mandibular dentures., The modes of failure are flexural fatigue failures caused by occlusal biting force and impact force failures caused by dropping the denture. To overcome these drawbacks, various approaches have been used. One approach is to increase its mechanical properties by the incorporation of a rubber phase in the bead polymer. Although this is a well-known method in plastic technology, it is expensive. The graft copolymers of rubber methacrylate produced by chemical modification are high-impact resins. Another approach used is by either modifying the composition or to devise a reinforcement of the denture base polymer with various reinforcement materials such as metal oxides, fibers, stainless steel wires, and mica. Many trials have been done to improve the strength of acrylic denture bases with the use of metal wires and cast metal plates. The main drawback with adding metal wire is weak bond between the wire and resin, which leads to insignificant change of mechanical properties. Although metal plates are expected to increase the strength, they are expensive and liable to corrosion. Other trials have also been made to strengthen acrylic resin materials by introducing various organic and inorganic reinforcing fibers into them. Metal, Kevlar®, glass, sapphire, polyester, carbon graphite, and rigid polyethylene are substances used for fiber strengthening. Reinforcement with fibers enhances the mechanical strength characteristics of denture bases, such as the transverse strength, ultimate tensile strength, and IS. In addition, fiber reinforcement has advantages compared with other reinforcement methods, including improved esthetics, enhanced bonding to the resin matrix, and ease of repair. Although most of the available literatures confirmed the superior mechanical properties of reinforced PMMA, there are many studies contradicting the same. In addition, with the availability of various reinforcement materials, the choice of selection becomes difficult for the operator. Hence, an evidence-based study is required to know the effect of reinforced PMMA on both FS and IS. There is enormous literature on various reinforcement materials and their effect on different properties, but according to the authors' knowledge, there is no single documentation on the compilation of all the reinforcement materials and their effect on various properties. The objectives of this meta-analysis review were to critically examine and compile the studies involving various reinforcement materials and determine the effect of these materials on FS and IS of PMMA. Hence, the present meta-analysis was conducted to summarize various reinforcement materials and their effect on FS and IS. This review was based on the Preferred Reporting Items for Systematic Reviews and Meta-Analyses (PRISMA) guidelines. All literatures that investigated the effect of reinforcement materials and their effect on the mechanical properties of PMMA were searched using the PRISMA statement guidelines with a predetermined search strategy. The search strategy was based on a population (heat-cured PMMA), intervention (different available reinforcement materials), comparison (unreinforced PMMA with reinforced PMMA), outcome (IS and FS), and study design (networking meta-analysis), i.e., PICOS framework [Table 1]. The search was done to include studies comparing IS and/or FS of reinforced and unreinforced heat-cured PMMA. Search terminologies included PMMA, reinforcement, PMMA impact strength, PMMA flexural strength, and heat cure PMMA. 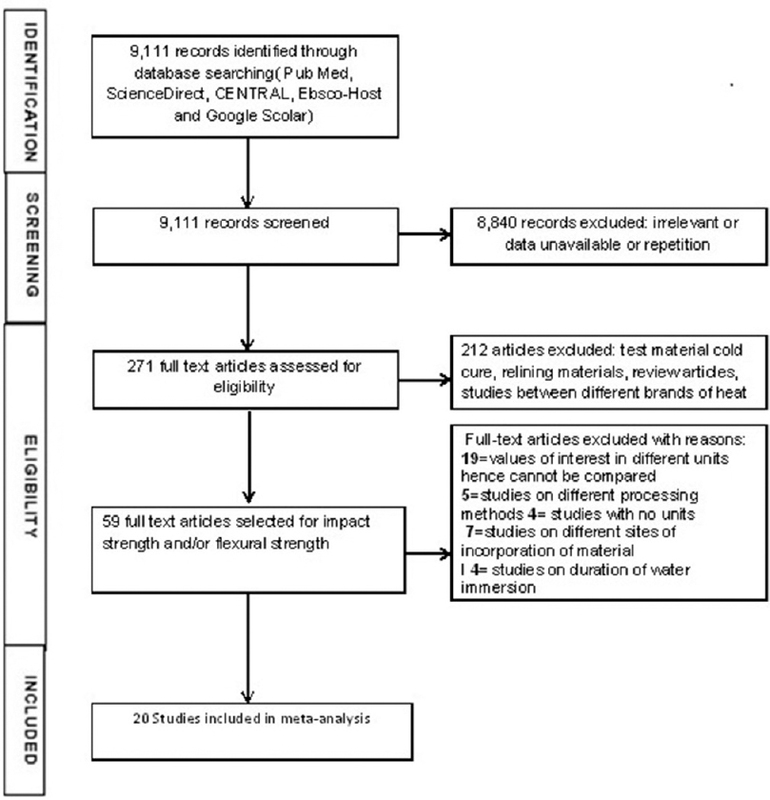 An electronic search of studies published in PubMed (www.ncbi.nlm.nih.gov./entrez/query.fcgi), ScienceDirect (www.sciencedirect.com), Google Scholar (http://scholar.google.com), Cochrane Central Register of Controlled trials (http://www.mrw.interscience.wiley.com/cochrane/cochrane_clcentral_articles_fs.htm), and Ebscohost till March 2018 was included. Search terms were a combination of the appropriate Medical Subject Headings terms and free-text words in simple or multiple conjunctions and were grouped into PICOS. Two reviewers read the titles and abstracts of the studies independently to decide whether the studies met the inclusion criteria. Full articles were examined if necessary. Any disagreement between the first two reviewers was resolved by third and fourth reviewers. Test methodology for IS should be Charpy test and/or Izod test though it was not an exclusion criterion. Studies without units and/or unconvertible units for FS (MPa) and IS (kJ/m2). Quality assessment was performed independently by two investigators using the Cochrane Collaboration tool for assessing risk of bias; any conflicts were discussed and resolved by another two authors. The tool contains two parts, addressing the seven specific domains (namely sequence generation, allocation concealment, blinding of participants and personnel, blinding of outcome assessment, incomplete outcome data, selective outcome reporting, and other issues). An estimated risk of bias (low, medium, or high) was assigned to each of the included studies by the investigators. The disagreements were resolved by discussion between all the four authors. Data were extracted by two reviewers independently using a designed form that included the following information: year of publication, type of reinforcement, type of study, conditioning of reinforcement, conditioning of samples, test methodology, sample size for reinforced and control group, and FS (MPa) and/or IS (kJ/m2) of reinforced and control groups, respectively. Contact was made with authors whenever the data were missing or ambiguous. The studies in which the data were not clearly stated were excluded from the analysis. Mean differences (MDs), a continuous outcome, were used to measure IS and FS. The level of significance was P ≤ 0.01. Heterogeneity was assessed for the outcomes in each study and investigated using forest plots and the I2 statistic. A random-effects model and a fixed-effects model were preferred for meta-analysis if statistically significant heterogeneity was identified among a group of studies. Publication bias was measured using visualization of funnel plots. Asymmetry of the funnel plot indicates publication bias and other biases related to the sample size. A total of 9111 records were identified through database searching (PubMed, Ebscohost, and Google Scholar), out of which 8840 records were excluded as they were irrelevant or data were unavailable, or due to repetition. The remaining 271 full-text articles were assessed for eligibility, out of which 212 articles were excluded due to either of the following reasons: test material was cold cure, relining material, review articles, and studies between different heat-cured resins. Of the 59 full-text articles selected for IS and/or FS, 39 full-text articles were excluded for the following reasons: values of interest in different units, hence cannot be compared (19); studies on different processing methods (5); studies with no units (4); studies on different sites of incorporation of material (7); and studies on the duration of water immersion (4). 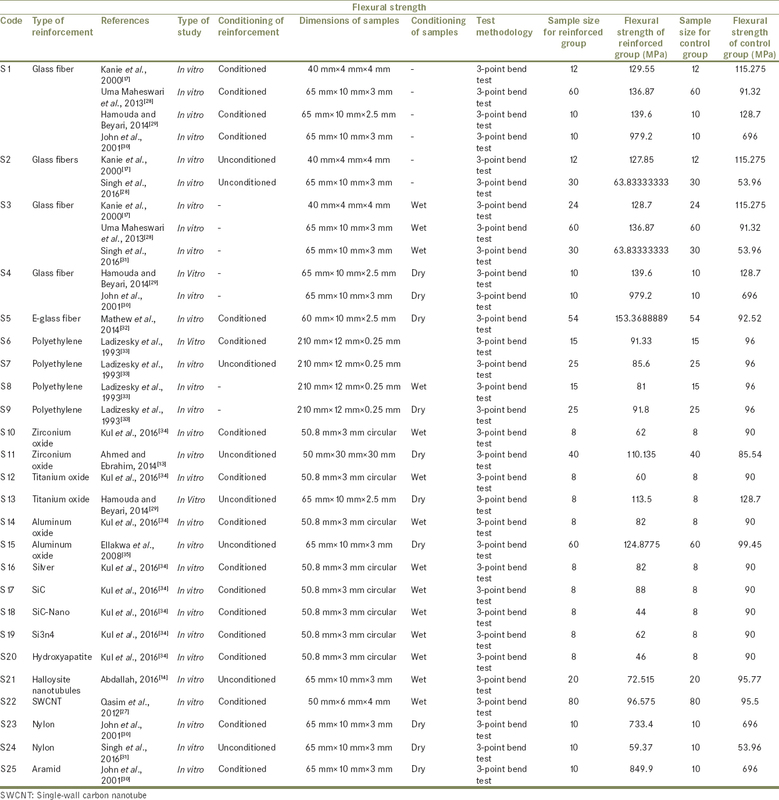 Thus, finally, twenty studies were included in the present meta-analysis [Figure 1]. 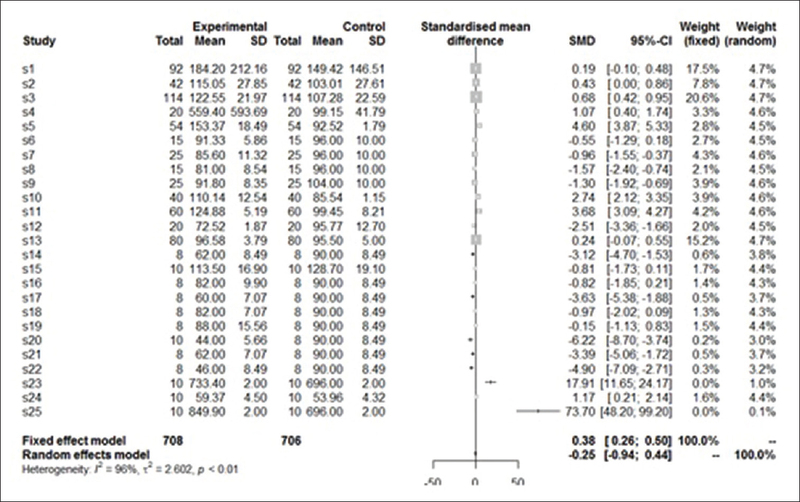 The meta-analysis was performed by combining the results of the twenty studies which included 15 and 25 reinforcement techniques for IS and FS, respectively [Table 2] and [Table 3]. The homogeneity test confirmed acceptable heterogeneity among the studies (i2 = 96%). A random-effects model and fixed-effects model were used. The results of IS demonstrated statistically significant heterogeneity with Q = 329.42 and df = 14, with P < 0.0001. We thus used the random-effects model and fixed-effects model. For fixed-effects model, the MD was 0.83 (95% confidence interval [CI] = 0.69; 0.98). For the random-effects model, the estimated MD was 2.1348 and the 95% CI was 1.3556; 2.9140, which indicates a statistically significant difference between the treatment and control groups in terms of IS of the reinforcement materials. Among the 15 studies, 14 yielded statistically significant results. 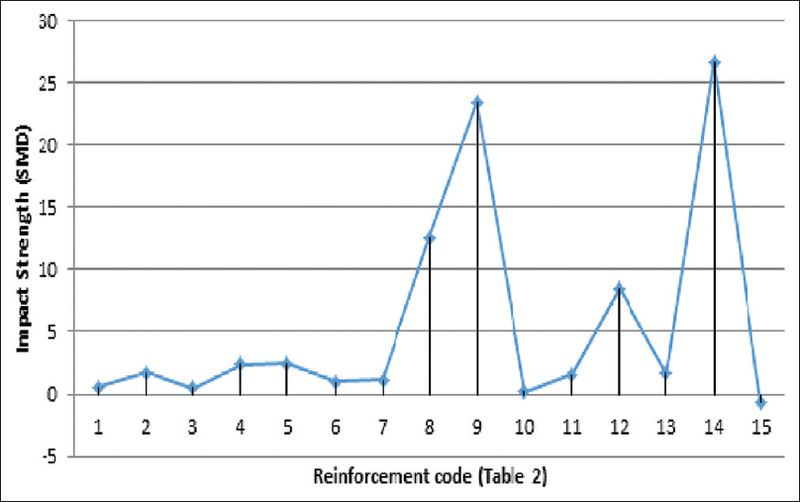 The difference was highest in reinforcement study 14 [Figure 2] and [Figure 3]. The results of FS demonstrated statistically significant heterogeneity with Q = 626.83 and df = 24, with P < 0.0001. For fixed-effects model, the estimated MD was 0.3777 and the 95% CI was 0.2564; 0.4989. For the random-effects model, the estimated MD was −0.2460 and the 95% CI was −0.9367; 0.4447, which indicates a statistically significant difference between the treatment and control groups in terms of FS of reinforcement materials. Among the 25 studies, 24 yielded statistically significant results. 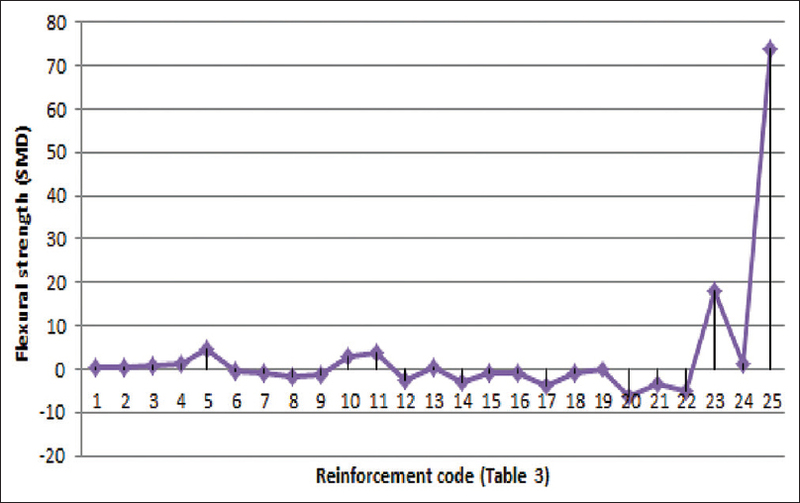 The difference was highest in reinforcement study 25 [Figure 4] and [Figure 5]. These results indicate that incorporation of reinforcement in PMMA can significantly increase its IS and/or FS. A visual inspection of the funnel plots showed no clear asymmetry, indicating the possible absence of publication bias. However, considering the small number of studies included in the meta-analyses, publication bias was given the low power of the statistical tests. Various methods have been tried to reinforce the acrylic resin denture bases. Metal inserts have been used in the form of wires, metal oxides, metal strengtheners, meshes, and plates, and the different fibers include Kevlar, glass, carbon graphite fibers, aramid fiber, ultra-high-molecular-weight polyethylene fiber, and polyethylene fibers to improve its mechanical properties. To the authors' knowledge, this is the first meta-analysis of the effect of various reinforcement materials on the IS and FS of PMMA. The result of this meta-analysis suggested that most of the reinforcement materials used in the past can significantly increase both IS and FS of PMMA. Furthermore, the effect of reinforcement was found to be affected by various factors including the size, shape, concentration, adhesion, and distribution of filler particles in the polymer matrix and strong adhesion at the interface.,,, Strengthening by fiber reinforcement is based on the principle that polymer matrix is fully capable of transferring an applied load to fibers via shear forces at the interface. Fibers used for reinforcement act as the main load-bearing constituents, and the matrix forms a continuous phase to surround and hold the fibers in place. Fibers used should be stiff to reinforce the brittle material; otherwise, it will have little or no effect on the properties. Adequate adhesion of the fibers to the polymer is the most important variable for the strength of the composite so that stresses can be transferred from the matrix to the fibers. Silane coupling agent can be used to improve the adhesion. Effective impregnation allows the resin matrix to come into contact with the surface of every fiber and thus bonding is improved. Concentration of the fiber, when increased judiciously, considerably affects the properties of PMMA, but increased concentration may induce voids. Addition of metal oxides improved some physical and mechanical properties of acrylic resin.,, The unpleasant discoloration that occurred even with the inclusion of a small percentage of metal indicated that the use of metal-filled PMMA should be in areas where it is not seen. The strength of these reinforced PMMA might allow their use in the posterior occlusal regions to withstand chewing stresses. Even with this apparent discoloration, which restricts the use of metal-filled resin to the palatal portion of upper and/or lingual flanges of lower dentures, the metal reinforcement is, nevertheless, likely to reduce the fracture incidence of acrylic denture. A marked gradual decrease was noticed in the tensile strength as the filler ratio increased which, in turn, limits the addition of fillers >5% by volume. The particle size is another factor; larger particles decreased the tensile strength because they settle when mixed with monomer. The average particle size was 10 μm to match the particle size of resin powder, which permits the use of a conventional method in finishing the specimens. Forest plot for the effect of various reinforcement materials on IS showed that all the reinforcement materials included in the studies comparing the IS had showed significantly higher values than unreinforced PMMA except single-walled carbon nanotubes. Polyester fibers had showed the highest IS followed by zirconium oxide, PMMA fibers, Kevlar fibers, glass fibers, steel wire, aluminum oxide, polyethylene fibers, and titanium oxide [Figure 2]. Whereas the forest plot for the effect of various reinforcement materials on FS showed that not all the reinforcement materials included in the studies comparing the FS showed superior result. Aramid fibers showed the highest value followed by nylon fibers, E-glass fibers, zirconium oxide, glass fibers, and titanium oxide, which showed significantly better result when compared to the unreinforced PMMA. Whereas Si3N4, polyethylene fibers, silver particles, SiC nano particles, aluminum oxide, halloysite nanotubes, SiC particles, carbon nanotubes, and hydroxyapatite showed inferior result [Figure 4]. Studies on the effect of reinforcement on both IS and FS were available with zirconium oxide, glass fibers, titanium oxide, aluminum oxide, polyethylene fibers, and carbon nanotubes. Among these, zirconium oxide, glass fibers, and titanium oxide showed improvement in both IS and FS, while aluminum oxide and polyethylene fibers showed increase in IS but reduced FS when compared with unreinforced PMMA. Carbon nanotube reinforcement exhibited decrease in both IS and FS. Studies on reinforcement with other materials evaluated either of the properties. Glass fibers have gained popularity as a reinforcing agent of PMMA because of their good esthetic qualities and good bonding to polymer via silane coupling agent. The preimpregnation makes the glass fiber easy to use and the fiber does not fray and can be placed in the desired region of the prosthesis. Glass fiber is shown to improve the mechanical properties, especially fatigue resistance, transverse strength, IS, and FS, but has no significant effect on the bending strength and surface hardness.,,,,, This can be attributed to good adhesion of the glass fibers to denture base polymer which transfers the stress applied to the matrix to the fibers, hence the low percentage of elongation at breakage of glass fibers. Another advantage is that, if the prosthesis fractures catastrophically, then the fractured portions are likely to remain in close proximity, held together by the fibers. Further, the increase in transverse strength can be explained on the basis of transformation toughening. When sufficient stress develops and a crack begins to propagate, a transformation of ZrO2 from the metastable tetragonal crystal phase to the stable monoclinic phase occurs which depletes the energy of crack propagation. Furthermore, in this process, expansion of ZrO2 crystals occurs and places the crack under a state of compressive stress, and crack propagation is arrested. Both mechanisms improve fracture resistance of denture base under applied mastication loads. Titanium dioxide (TiO2) is a naturally occurring white-colored mineral. This is highly biocompatible. Studies have shown that TiO2 fillers resulted in significant increase in IS and fracture toughness and significant decrease in water sorption and solubility; modification of heat-cured acrylic resins with certain amounts of metal oxide may be useful in preventing denture fractures and undesirable physical changes resulting from oral fluids clinically. When short-length polyester fibers were added as resin strengtheners in a randomly oriented method, the denture can be processed easily by the traditional procedure without causing any esthetic problems. Use of polyester fibers has demonstrated multiple-fold improvement on IS, but had no significant effect on the bending strength and surface hardness. The present meta-analysis revealed that reinforcement with carbon nano tubes resulted in reduction of both IS and FS of PMMA. Other reinforcing agents including Si3N4, silver particles, SiC particles, halloysite nano tubes, and hydroxyapatite showed inferior result for FS when compared to unreinforced PMMA. Apart from reinforcement materials, milled PMMA-based dentures are considered a recent mode of advancement. They are claimed to be of better mechanical properties, and hence can be considered for future research and development. This study cannot claim the superiority of any single reinforcement material as there are multiple variables, i.e., concentration, physical properties, and chemical properties, which were not included as these were not mentioned in most of the articles and hence were out of the scope for the authors. Due to lack of sufficient literature on thein vivo effect of the reinforced PMMA, the meta-analysis included all thein vitro studies. In addition, the present meta-analysis included very few articles; hence, bias must be considered as the main drawback. Many studies were excluded due to incomplete data, studies with different parameters, different procedures, and/or studies not falling in our inclusion criteria; hence, the total number of studies included were very few which can lead to bias. Furthermore, different concentrations of reinforcement were used by different authors, which can significantly affect the outcome. Overall, this meta-analysis confirms the superiority of reinforced PMMA when compared to unreinforced PMMA in its mechanical properties. The authors suggest morein vivo studies to be done to know the clinical performance of reinforced PMMA, and also insist to work on standardization of these materials based on their physical and chemical composition along with a specific concentration for the best results. The authors have tried to include the maximum available studies on different reinforced PMMA resins and emphasize on the commercial development of these reinforcement materials. Hence, to increase the clinical life of PMMA, these reinforcement materials can be taken into consideration according to clinical requirement, patient's need, and clinician and laboratory personnel's skill. The authors would like to thank Dr. Prashant Joshi, Professor and Head, MBA program, Dean, Faculty of Commerce and Management, Uka Tarasadia University, India, for his contribution in statistical analysis. Uzun G, Hersek N, Tinçer T. Effect of five woven fiber reinforcements on the impact and transverse strength of a denture base resin. J Prosthet Dent 1999;81:616-20. Ranganath LM, Shet RG, Rajesh AG, Abraham S. The effect of fiber reinforcement on the dimensional changes of poly methyl methacrylate resin after processing and after immersion in water: An in vitro study. J Contemp Dent Pract 2011;12:305-17. Mansour MM, Wagner WC, Chu TM. Effect of mica reinforcement on the flexural strength and microhardness of polymethyl methacrylate denture resin. J Prosthodont 2013;22:179-83. Kim SH, Watts DC. The effect of reinforcement with woven E-glass fibers on the impact strength of complete dentures fabricated with high-impact acrylic resin. J Prosthet Dent 2004;91:274-80. Agha H, Flinton R, Vaidyanathan T. Optimization of fracture resistance and stiffness of heat-polymerized high impact acrylic resin with localized E-glass fiBER FORCE® reinforcement at different stress points. J Prosthodont 2016;25:647-55. Praveen B, Babaji HV, Prasanna BG, Rajalbandi SK, Shreeharsha TV, Prashant GM. Comparison of impact strength and fracture morphology of different heat cure denture acrylic resins: An in vitro study. J Int Oral Health 2014;6:12-6. Asar NV, Albayrak H, Korkmaz T, Turkyilmaz I. Influence of various metal oxides on mechanical and physical properties of heat-cured polymethyl methacrylate denture base resins. J Adv Prosthodont 2013;5:241-7. Jagger D, Harrison A, Vowles R, Jagger R. The effect of the addition of surface treated chopped and continuous poly (methyl methacrylate) fibres on some properties of acrylic resin. J Oral Rehabil 2001;28:865-72. Jagger D, Harrison A, Jagger R, Milward P. The effect of the addition of poly(methyl methacrylate) fibres on some properties of high strength heat-cured acrylic resin denture base material. J Oral Rehabil 2003;30:231-5. Chen SY, Liang WM, Yen PS. Reinforcement of acrylic denture base resin by incorporation of various fibers. J Biomed Mater Res 2001;58:203-8. Murthy HB, Shaik S, Sachdeva H, Khare S, Haralur SB, Roopa KT. Effect of reinforcement using stainless steel mesh, glass fibers, and polyethylene on the impact strength of heat cure denture base resin – An in vitro study. J Int Oral Health 2015;7:71-9. Ihab NS, Moudhaffar M. Evaluation the effect of modified nano-fillers addition on some properties of heat cured acrylic denture base material. J Bagh Coll Dent 2011;23:23-9. Ahmed MA, Ebrahim MI. Effect of zirconium oxide nano-fillers addition on the flexural strength, fracture toughness, and hardness of heat-polymerized acrylic resin. World J Nano Sci Eng 2014;4:50-7. Abdallah RM. Evaluation of polymethyl methacrylate resin mechanical properties with incorporated halloysite nanotubes. J Adv Prosthodont 2016;8:167-71.
al-Mulla MA, Murphy WM, Huggett R, Brooks SC. Effect of water and artificial saliva on mechanical properties of some denture-base materials. Dent Mater 1989;5:399-402. Vallittu PK. A review of fiber-reinforced denture base resins. J Prosthod 1996;5:270-6. Andreopoulos AG, Papaspyrides CD, Tsilibounidis S. Surface treated polyethylene fibres as reinforcement for acrylic resins. Biomaterials 1991;12:83-7. Doǧan OM, Bolayir G, Keskin S, Doǧan A, Bek B, Boztuǧ A. The effect of esthetic fibers on impact resistance of a conventional heat-cured denture base resin. Dent Mater J 2007;26:232-9. Faot F, Costa MA, Del Bel Cury AA, Rodrigues Garcia RC. Impact strength and fracture morphology of denture acrylic resins. J Prosthet Dent 2006;96:367-73. Jagger DC, Harrison A, Jandt KD. The reinforcement of dentures. J Oral Rehabil 1999;26:185-94. Darbar UR, Huggett R, Harrison A. Denture fracture – A survey. Br Dent J 1994;176:342-5. Smith DC. Acrylic denture. Mechanical evaluation; mid-line fracture. Br Dent J 1961;110:257-67. Gutteridge DL. Reinforcement of poly (methyl methacrylate) with ultra-high-modulus polyethylene fibre. J Dent 1992;20:50-4. Vallittu PK, Vojtkova H, Lassila VP. Impact strength of denture polymethyl methacrylate reinforced with continuous glass fibers or metal wire. Acta Odontol Scand 1995;53:392-6. Qasim SB, Al Kheraif AA, Ramakrishaniah R. An investigation into the impact and flexural strength of light cure denture resin reinforced with carbon nanotubes. World Appl Sci J 2012;18:808-12. Uma Maheswari B, Geetha PK, Nagaraj KR, Shwetha K. Comparative analysis of the flexural strength of conventional polymethyl methacrylate resin, high impact resin and glass fiber reinforced resin – An in vitro study. Indian J Dent Sci 2013;5:77-9. John J, Gangadhar SA, Shah I. Flexural strength of heat-polymerized polymethyl methacrylate denture resin reinforced with glass, aramid, or nylon fibers. J Prosthet Dent 2001;86:424-7. Singh K, Sharma SK, Negi P, Kumar M, Rajpurohit D, Khobre P. Comparative evaluation of flexural strength of heat polymerised denture base resins after reinforcement with glass fibres and nylon fibres: An in vitro study. Adv Hum Biol 2016;6:91-4. Mathew M, Shenoy K, Ravishankar KS. Flexural strength of E-glass-reinforced PMMA. Int J Exp Dent Sci 2014;3:24-8. Ladizesky NH, Cheng YY, Chow TW, Ward IM. Acrylic resin reinforced with chopped high performance polyethylene fiber – Properties and denture construction. Dent Mater 1993;9:128-35. Kul E, Aladaǧ Lİ, Yesildal R. Evaluation of thermal conductivity and flexural strength properties of poly (methyl methacrylate) denture base material reinforced with different fillers. J Prosthet Dent 2016;116:803-10. Ellakwa AE, Morsy MA, El-Sheikh AM. Effect of aluminum oxide addition on the flexural strength and thermal diffusivity of heat-polymerized acrylic resin. J Prosthodont 2008;17:439-44. Matsukawa S, Hayakawa T, Nemoto K. Development of high-toughness resin for dental applications. Dent Mater 1994;10:343-6. Knott NJ. The durability of acrylic complete denture bases in practice. Quintessence Int 1989;20:341-3. Sehajpal SB, Sood VK. Effect of metal fillers on some physical properties of acrylic resin. J Prosthet Dent 1989;61:746-51. Zuccari AG, Oshida Y, Moore BK. Reinforcement of acrylic resins for provisional fixed restorations. Part I: Mechanical properties. Biomed Mater Eng 1997;7:327-43. Marei MK, El-Sabrooty A, Ragab AY, El-Osairy MA. A study of some physical and mechanical properties of metal-filled acrylic resin. Saudi Dent J 1994;6:69-77. Vallittu PK, Narva K. Impact strength of a modified continuous glass fiber – Poly (methyl methacrylate). Int J Prosthodont 1997;10:142-8. Ayad NM, Badawi MF, Fatah AA. Effect of reinforcement of high-impact acrylic resin with zirconia on some physical and mechanical properties. Rev Clín Pesq Odontol 2008;4:145-51. Grant AA, Greener EH. Whisker reinforcement of polymethyl methacrylate denture base resins. Aust Dent J 1967;12:29-33. Dixon DL, Breeding LC. The transverse strengths of three denture base resins reinforced with polyethylene fibers. J Prosthet Dent 1992;67:417-9. Taner B, Doǧan A, Tínçer T, Akinay AE. A study on impact and tensile strength of acrylic resin filled with short ultra-high molecular weight polyethylene fibers. J Oral Sci 1999;41:15-8. Capaccio G, Ward IM. Properties of ultra-high modulus linear polyethylene. Nature Phys Sci 1973;243:143-5. Carroll CE, von Fraunhofer JA. Wire reinforcement of acrylic resin prostheses. J Prosthet Dent 1984;52:639-41. Ruffino AR. Effect of steel strengtheners on fracture resistance of the acrylic resin complete denture base. J Prosthet Dent 1985;54:75-8. Vallittu PK. Dimensional accuracy and stability of polymethyl methacrylate reinforced with metal wire or with continuous glass fiber. J Prosthet Dent 1996;75:617-21. Vallittu PK, Lassila VP. Effect of metal strengthener's surface roughness on fracture resistance of acrylic denture base material. J Oral Rehabil 1992;19:385-91. Vallittu PK. Effect of some properties of metal strengtheners on the fracture resistance of acrylic denture base material construction. J Oral Rehabil 1993;20:241-8. Ramos V Jr., Runyan DA, Christensen LC. The effect of plasma-treated polyethylene fiber on the fracture strength of polymethyl methacrylate. J Prosthet Dent 1996;76:94-6. Pourdeyhimi B, Robinson HH 4th, Schwartz P, Wagner HD. Fracture toughness of Kevlar 29/poly(methyl methacrylate) composite materials for surgical implantations. Ann Biomed Eng 1986;14:277-94.